Hello to all! I am an English and Spanish teacher.I like this website.Enjoy my worksheets, I am so glad to share them with you and thank you a lot for your comments. This worksheet is aimed to drill answers with time. It can also useful in learning television vocabulary. 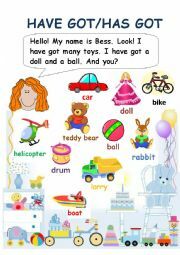 You can also do some speaking and writing activities. All depends on your imagination.Good luck. P.S. thanks a lot to Philip Roeland for template. 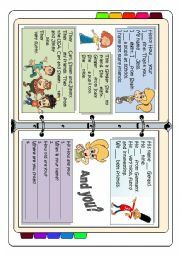 a worksheet for young learners to practise HAVE/HAS GOT. The pictures help you to distinguish has got and have got It was used for practising the afirmative, negative and interrogative forms. 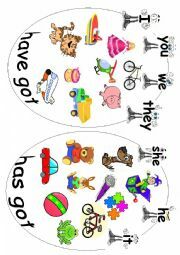 Children learn hpw to make sentences with have got or has got and also the difference between "Have got" and "has got" forms. Hope You like it. 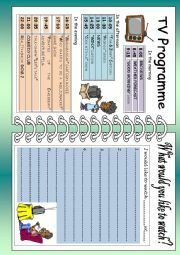 a worksheet for young learners to practise HAVE/HAS GOT. The pictures help you to say what the girl has got and what you have got too. It used to practise the affirmative forms and also it shows the difference between "Have got" and "has got" forms. Hope You like it.